Long live the banner ad: it has managed to survive not only the dot com bubble but also Facebook’s IPO. Yet few admit to wishing to perpetuate its existence. Talk of ‘social advertising’ usually means buying ads on Facebook, Promoted Trends on Twitter, or even the new SlideShare ads — complete with inline lead capture — on LinkedIn. A few companies have been hard at work at transforming the banner ad into a richer experience. A richer experience of course transfers into engagement — the hoped-for, hyped metric that seems to have eluded the banner ad about 10 years ago. Chicago-based NowSpots, recipient of a Knight Foundation grant and a Y Combinator alum, launched in order to create banner ads wherein an advertiser can include Facebook content, tweets, or Pinterest photos directly in the ad unit. Brilliant. I tried to catch up with founder Brad Flora but I have reason to believe that NowSpots has pivoted and is now offering another digital service (the Twitterfeed hasn’t been updated in one year). Though NowSpots’s ad units conform to Interactive Advertising Bureau (IAB) standards and can be distributed through Google’s Doubleclick network, the risk for advertisers is huge, as live social content is difficult to control and measure. Advertisers take painstaking steps to measure the effectiveness of one ad creative vs. another, and with the living nature of social content, an advertiser cannot be sure of the exact content which delivered the clickthroughs. Other companies — even large incumbent players — continue the effort to socialize the humble banner ad. Last month, Microsoft announced a bold move to socialize banner ads served in its advertising network. For starters, Microsoft is partnering with social commerce company Bazaarvoice to supply user-generated product reviews and ratings which will be delivered right inside the ad unit. 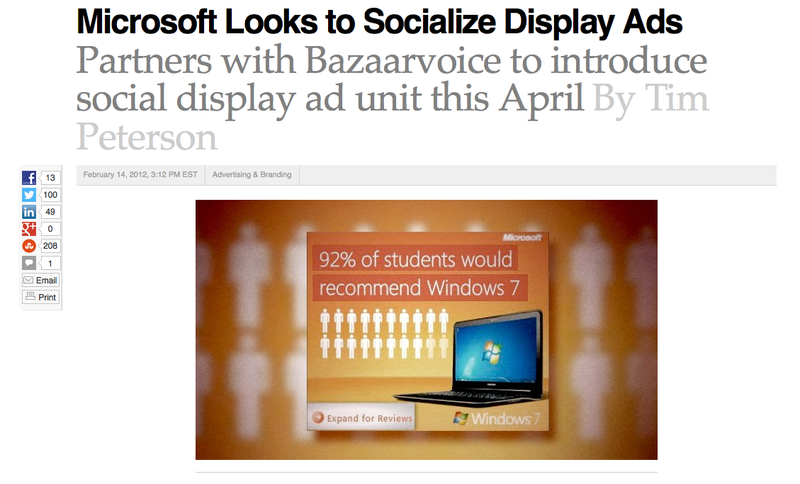 Microsoft partners with Bazaarvoice to create review-generated advertising content. Other partners will be announced shortly, and I’m excited to witness these developments. Let’s face it: no one clicks on banners, and if advertising is to continue to be a revenue source for thousands of publishers, it will need to perform in order to fund the growing media industry. Indeed, according to a Harvard Business School and IAB study, the ad-supported Internet contributed 5.1 million U.S. jobs and $530 billion to the U.S. economy in 2011. Facebook, Twitter, LinkedIn, Pinterest, and Instagram may hold our attention — while we are on their sites and apps — but why shouldn’t that exciting content be ported to other sites? Thanks to APIs provided by the social networks, this can be a reality, and can create an interdependent ecosystem of relevant, valuable, engaging ads that continue to fuel an industry that charges us a price we can all agree on: free. ‘Everything needs to be evocative with a behavioral goal,’ adds Leis.